Cyxtera ABQ1 - Albuquerque Data Center is located at 400 Tijeras Avenue Northwest. The data center is 421290 sqft. There is a total of 24000 sqft in raised floor space for colocation. It has access to 6 MW of power. We found 1 data center location within 50 miles of this facility. Certifications for this location include HIPAA, PCI-DSS, ISO 27001, SOC 1, NIST 800-53, SSAE-18. As part of Cyxtera's global network of over 50 data centers, their Albuquerque data center is designed to make technology more agile, secure and sustainable. Their inclusive colocation-to-cloud solutions supply the infrastructure and foundation that makes information sharing and ongoing technology advancement possible. 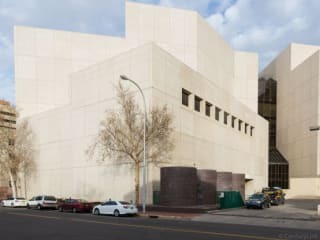 The Albuquerque data center is an advanced multi-tenant offering that provides the network and space to enable rapid innovation within this technology cluster. Built to Tier III standard, this Level 5 commissioned facility provides complete electrical and mechanical system redundancy as well as a full complement of colocation, cloud, and managed services, all protected by adaptable multi-tier security. With more than 421,000 sq/ft of total floor space and 6MW power capacity, the Albuquerque data center is designed to advance enterprise.